China is the world‘s largest holder of foreign exchange reserves. 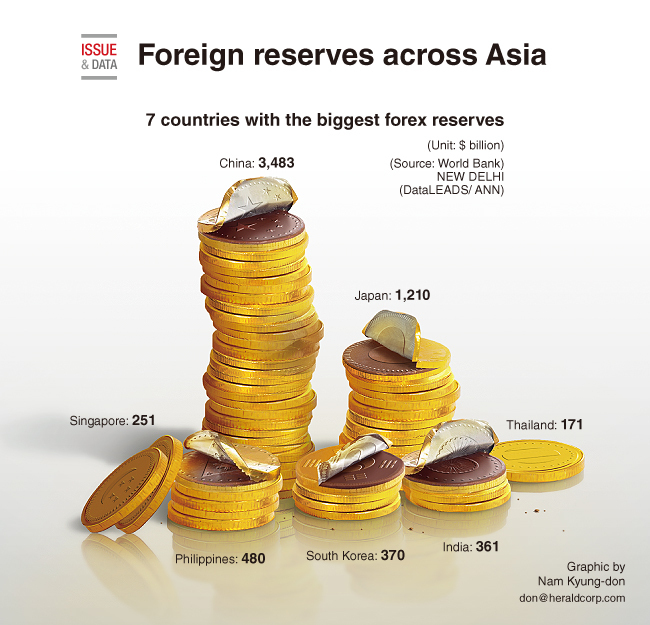 It has over 2 1/2 times more foreign reserves than the second-largest reserve holder, Japan. The Asian giant has $3.483 trillion in foreign exchange reserves, despite a recent drop. China is followed by Japan, with a substantial $1.21 trillion worth of foreign exchange. South Korea and India also have a large pie of the foreign exchange. In South Korea, the foreign exchange reserve is $370 billion, while India holds $361 billion worth of foreign exchange, as per World Bank data. Other Asian nations which have sizeable foreign reserves are Singapore ($251 billion), Thailand ($171 billion) and Indonesia ($116 billion). Malaysia, Philippines and Vietnam have reserves of $94 billion, $480 billion and $36 billion, respectively.